Easy, bake at home bread, just add 2 ingredients. Flatbread Fusions allows you to create your own custom Flatbread! Add your own fresh chopped veggies and/or fruit to the Flatbread Fusions base. Beak appealing Flatbread Fusions comes complete with all the basic ingredients needed to bake up a healthy organic bird bread. Nutty flavored, easily digested KAMUT® Brand flour forms the base for this nutrient rich flatbread. KAMUT® Brand flour offers energizing proteins, Vitamin E and is well tolerated by wheat sensitive birds. Easy to prepare, fun to be creative and bake your own bird bread at home! Simply add water, a beaten organic egg along with any add-ins you like. Makes a jumbo sized 9 x 13 pan. Freeze left-over’s for those hectic days. Produces a very dense, flat bird bread, which results in much less waste. 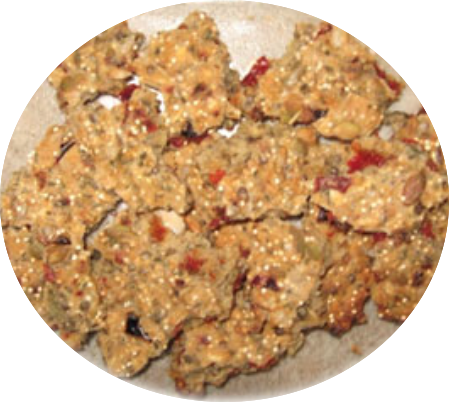 No baking powders, no cornmeal or soy fillers - just organic ancient grains, various seeds, peppers and herbs. Watch the tails' up reaction to this delicious flatbread! KAMUT® Brand, quinoa grain, kamut flake, hemp seeds, sunflower kernels, pumpkin seeds, red peppers, ginger, dandelion leaf.